BROOKLYN, New York (WTVD) -- Luke Kennard made two clutch jumpers in the final 2:04 to help No. 14 Duke thwart a rally by Clemson and advance to the quarterfinals of the Atlantic Coast Conference Tournament with a 79-72 victory Wednesday. The fifth-seeded Blue Devils (24-8) play fourth-seeded and No. 8 Louisville on Thursday at Barclays Center. Kennard took a while to find his shot but finished with 20 points. Freshmen Jayson Tatum and Frank Jackson each scored 20 and picked up the slack while Kennard was cold. "I think that's a heck of a performance when a player it isn't going and then it goes that shows you're a different player. You're a special player when you're able to do that," Duke coach Mike Krzyzewski said. Jaron Blossomgame led Clemson (17-15) with 19 points and eight rebounds. Duke built a 13-point lead midway through the second half but could not easily put away Clemson. 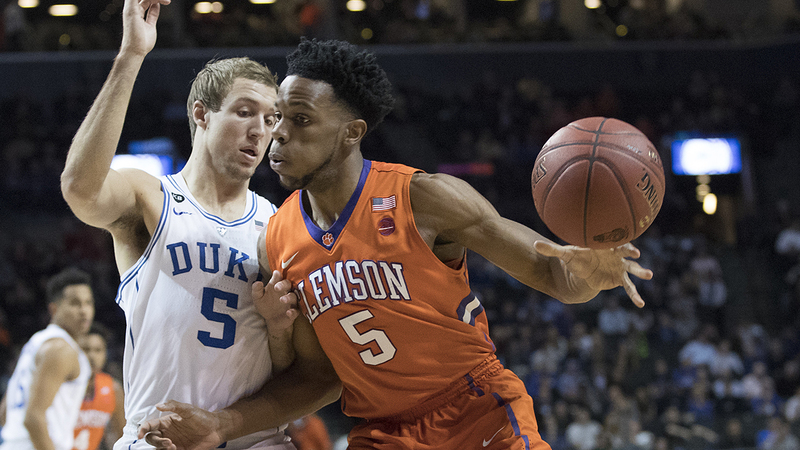 Duke guard Frank Jackson (15) and forward Amile Jefferson, smother Clemson forward Elijah Thomas on Wednesday at the ACC Tournament. Marcquise Reed converted a 3-point play with 2:51 left to cut Duke's lead to 69-68 and get the small contingent of Tigers fans in Barclays, pumped up. Kennard answered with a jumper to push the lead back to three. He dropped in a fallaway from the baseline with 1:14 left to up the lead to 75-70. "The biggest thing I can take away from this is how much confidence my coaches, my teammates, they have in me," Kennard said. "They continue to tell me to be aggressive." The Tigers came into the game having lost 10 games by six points or fewer, including a two-point loss to Duke during the regular season. File another one under missed opportunities for Clemson. The Tigers were 24 for 26 from the foul line but didn't have the 3-point shooting to provide balance and answers for Duke's proficient offense. With Grayson Allen nursing a sore ankle and coming off the bench at the end of the season, Jackson has played his best ball since the nonconference schedule. He had averaged 17.6 points per game in the last three regular-season games. Jackson gives Duke a true point guard instead of Krzyzewski having to force Allen in at the point. K to Frank Jackson as they're exiting the court:"You're going to be the key for us, you know that right?" Allen was called for a technical foul for a second straight game when he slammed the ball on the floor after getting called for a loose ball foul. He was whistled for running into Blossomgame. Allen grabbed the bouncing ball as he moved toward the corner of the court on the opposite side of the benches. He then slammed the ball down in obvious anger and was hit with a technical, giving him three personal fouls. His next stop was the bench. It's a testament to the Blue Devils' depth that Allen's ineffectiveness mattered little. He missed all four of his field-goal attempts and failed to score. "Crazy as it may sound, I think we're still evolving because of all the injuries and interruptions that we've had. But we're getting better," Krzyzewski said. "I don't know who we are completely, but I have good kids. I have really good kids, and they play hard, and they share the ball. Maybe we'll develop a little bit more of an identity here. We've got another chance, let's put it that way." The Blue Devils lost their only meeting with Louisville this season, falling 78-69 on the road. Should Duke beat Louisville in this rematch, Krzyzewski will pass former North Carolina coach Dean Smith for the most alltime wins in the ACC Tournament.